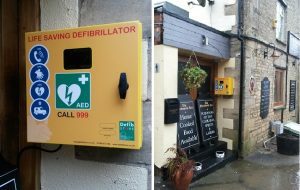 Greatworth Parish Council has provided a community defibrillator in the village for use by the public on victims of sudden cardiac arrest (heart attacks). A defibrillator is a portable machine that automatically sends an electric shock to the heart muscle to return it to its normal rhythm – this device is accessible 24 hours a day. IMPORTANT: In the event of an emergency dial 999 and ask for an ambulance before you do anything else. YOU DO NOT NEED TO BE TRAINED TO USE THIS EQUIPMENT – THE DEVICE WILL TALK YOU THROUGH WHAT YOU NEED TO DO. REMEMBER TO DIAL 999 FIRST. Where can I find the defibrillator? The device is located in the former doorway of the Greatworth Inn on Chapel Road. The Parish Council are very grateful to the Greatworth Inn for offering to install the unit on their premises. Who paid for it? The Council secured a grant of £999 from South Northants Council which covered the majority of the costs and the Greatworth Inn very kindly offered to install it on their premises. Who will pay for it in future? Since the Parish Council is responsible for the ongoing costs of maintenance and replacement of the units, funds will come from the parish budget. A ring-fenced fund has been set up, which will also cover additional costs of replacement consumables etc. The Greatworth Inn has generously agreed to cover the running costs of the unit.